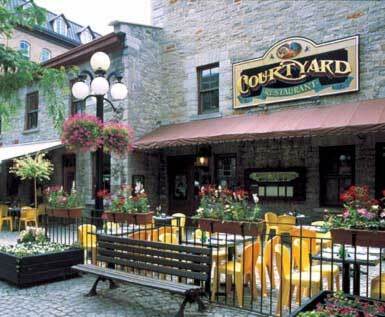 This restaurant is located in Ottawa in the area known as Bytown one of the oldest areas in the city. The restaurant itself is in a building erected in 1837.The restaurant gets its name assumingly from it’s location. It’s literally facing a stone courtyard which is surrounded on all sides by other similar heritage buildings and thus made it a little difficult to locate (not to mention the cabbie almost took us to the Courtyard Marriot). The only thing visible from the street is a tiny sign directing you to walk in towards the courtyard. I went here for dinner with co-workers. There were a few dining areas however the cozy area we were set up in was the McArthur Room. Since it was with a group of co-workers I managed to try a lot of their dishes (not to mention all the desserts on the menu). Both were extremely tasty and I was surprised with the Agnolotti seeing that it contained many things I normally don’t eat (mushrooms & goat cheese), however the taste was definitely unique and everything was so well put together I really liked it. The scallops were good however rather basic in comparison to the other dishes. Out of all these I was most impressed with the Elk. It was extremely tasty without any gamey kind of taste to it. If you’re not fan of the way beef tastes, I think you’d really enjoy Elk. There was just a nice natural sweetness to the meat without and funky tastes. All of this was washed down with an excellent selection in the Kingston Estate Shiraz ’03 (AUS). I’m not a wine connoisseur at all, however I must say shiraz was absolutely delicious. To finish off the night a dessert coffee was had and a sampling of all the desserts on the menu. Everything was well prepared and absolutely put together in terms of atmosphere, service, and food.